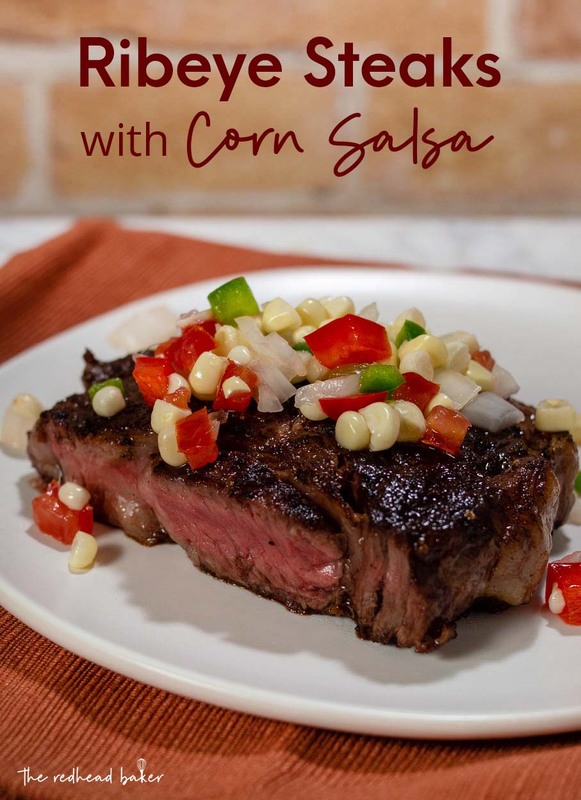 Ribeye steaks with corn salsa is a simple meal with lots of summer flavor. It’s ready in about 30 minutes! Use leftover salsa on other meats like pork or chicken. Happy Farmers Market Week! This week was designated in 2016 by then-USDA Secretary Tom Vilsack to help show how much value farmers markets bring to their communities. Did you know that farms that sell locally create 13 new jobs per million dollars in revenue vs. three jobs created by farms that don’t sell locally? Farmers markets also help bring fresh food to places known as “food deserts,” usually low-income areas with no grocery stores. 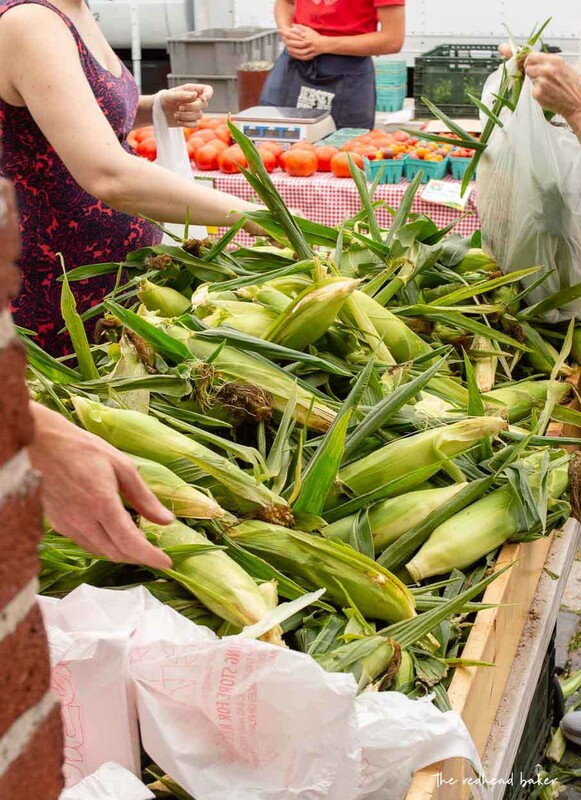 I feel very fortunate to live near the Headhouse Farmers Market, operated by The Food Trust, which is in its eleventh year, and just recently switched from a seasonal market to a year-round market! It features vendors not only from local farms with fresh fruits and vegetables, but also from dairies that sell milk, cheese, and eggs; fisherman; bread bakers; artisan chocolate makers; as well as vendors that sell small-batch ice cream, jams and preserves, and pickled vegetables. There’s even a knife-sharpening service once a month! Seeing as it’s summer time, some of the most popular items at the market are fresh Jersey sweet corn and fresh Jersey tomatoes. They have an unbelieveable flavor, and I really wanted to use both in one of my Farmers Market Week recipes. When I think of summer tomato recipes, I think of salsa. So, why not make a farmers market salsa with corn and bell peppers and other fresh veggies from the market? 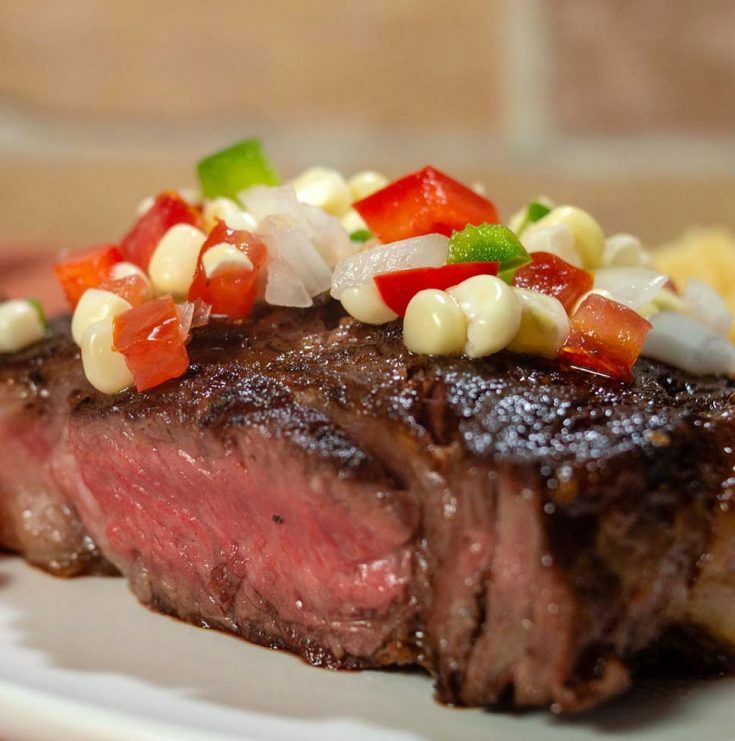 I put this delicious salsa on top of a ribeye steak, a flavorful and tender cut from the rib area of the cow. The marbling makes it ideal for a fast, hot sear in a cast-iron skillet. 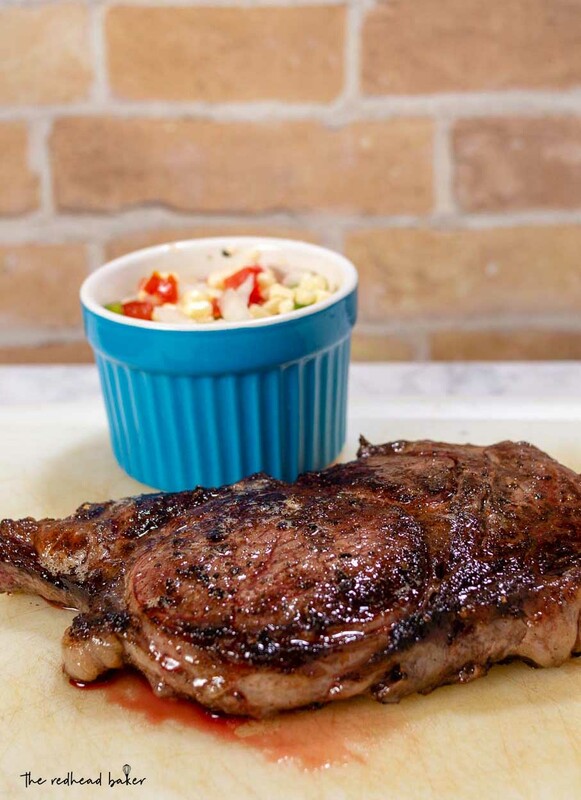 Of course, don’t forget to allow your steak to rest for at least 10 minutes after cooking, otherwise, you’ll end up with dry, tough steak and a cutting board full of the juices that would have kept your meat moist. 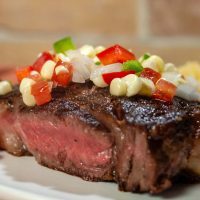 Ribeye steaks with corn salsa is a simple meal with lots of summer flavor. It's ready in about 30 minutes! Place the ears of corn, still in their husks, on a plate and place in the microwave. Cook on HIGH for 3 minutes. Remove from the microwave to a clean towel and let them cool. While they are cooling, combine the diced peppers, tomato and onion in a mixing bowl. Season with salt and pepper. Once the corn is cool enough to handle, use a sharp chef's knife to cut the kernels from the cob. Add to the other salsa ingredients. Add the lime juice to the salsa and toss to coat. Taste, and add more salt and pepper if needed. Heat the olive oil and butter in a seasoned cast-iron skillet over medium-high heat. Season the steaks on both sides with salt and pepper. Add the steaks to the pan, and cook for about 5 minutes, until browned and the steak no longer sticks to the pan. Turn the steak over and cook another 5 minutes for medium-rare doneness, basting the top of the steak with the butter/olive oil/drippings, until the second side is browned and easily releases from the pan. Transfer to a cutting board and let the steak rest for 10 minutes. Then, sliced against the grain. 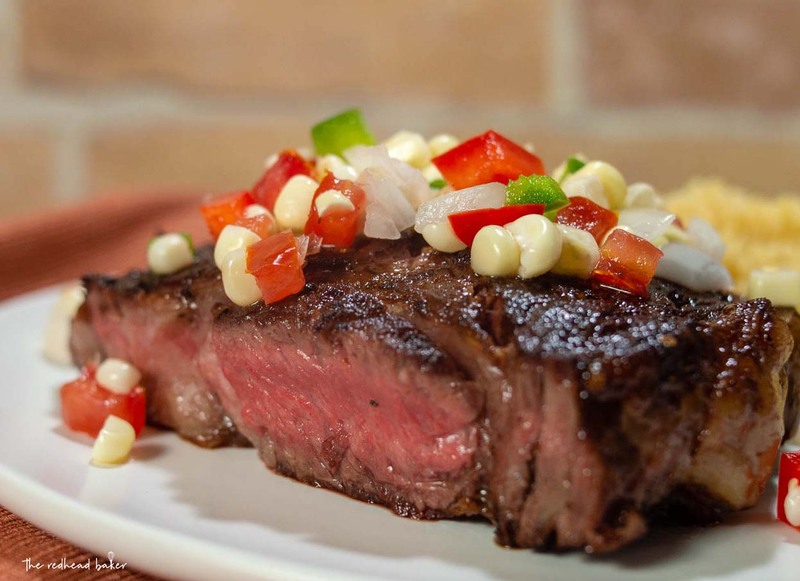 Divide the steak between two plates and serve with the corn salsa. I love the simplicity and freshness of this salsa….so many possibilities for application. Now I know what I want for dinner. That all looks so good together!